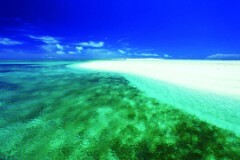 O-ha Island is located 400 meters east of Ou Island, and also called East Ou. At the end of the Meiji Period, two households moved to the island from Tonaki in the Keramas. By 1960, the population had increased to 134, but after that residents increasingly moved to Okinawa main island. As of 2002, three household still stayed on the island. The lifestyle on O-ha Island has remained the same for a long time. 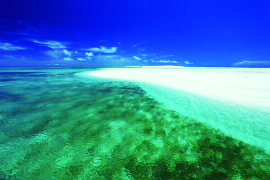 In the west of the island, a white sandy beach, Hatenohama (beach on the edge) stretches out 7 kilometers, and the area is famous among those enjoying scuba diving and fishing.